Eight tense upper sixth students stepped out of their comfort zone on Tuesday of this week to pitch their design work to five industry experts in Truro School’s first ever staging of the popular TV programme Dragon’s Den. Each student had ten minutes to convince the panel of the effectiveness, sustainability and marketability of their product – talking through client needs, market research, product specifications and aesthetics among other criteria. Among some of the ideas was a drying rack for an Aga; a bar and a bike box. Members of the Den asked some tricky questions including the suitability of product materials, use of different production techniques and meeting market needs – all of which were fielded brilliantly by our sixth form design students. 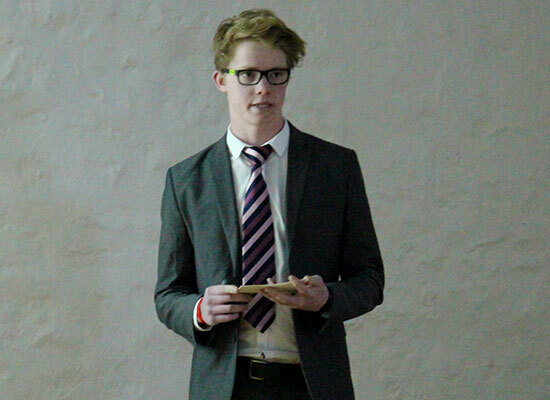 Jonny Innes is pictured here presenting his ideas on creating a carry bike box.